Is The Perfect Storm Brewing For Boise State and TCU? This much is clear. If Florida and Alabama win out until the Southeastern Conference championship game, and Texas wins the rest of their games as well, the Longhorns will face the SEC champion in the national championship game. But a loss by any of those teams, particularly Texas, would open up opportunities for several other teams currently on the outside of the national championship race. In addition to Texas, Florida, and Alabama, Iowa, Cincinnati, Texas Christian, and Boise State are also undefeated. After their shocking thumping of USC on Saturday night, Oregon is currently the highest-ranked team with a loss. 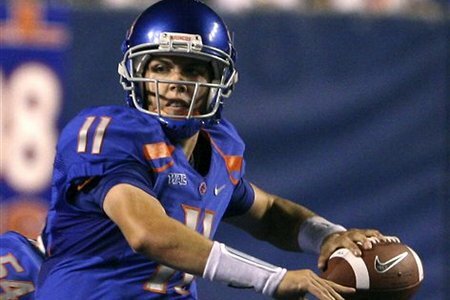 And the team that Oregon lost to this season was quarterback Kellen Moore (pictured) and Boise State. So say Texas loses to Texas A&M or Kansas or any of the teams left on their schedule. Florida and Alabama have to play each other, so one of them will lose. Next in line would be either Iowa or Cincinnati. Iowa has made a habit of winning close games, and they are only three games away from completing a perfect season. But one of those games is at Ohio State, and although this has not been a banner year for the Buckeyes, we think they have a damn good shot at beating the Hawkeyes in Columbus. Cincinnati has had a great year, and we have wondered about their national championship aspirations before, but their two biggest challenges of the season (home to West Virginia on the Nov. 13 and at Pittsburgh on Dec. 5.) still loom on the schedule. So say Iowa and Cincinnati both lose. Then things get interesting. Texas Christian is a member of the Mountain West Conference, while Boise State is a member of the Western Athletic Conference. Neither conference is a football powerhouse, but the MWC has a much better roster of teams than the WAC. An undefeated Texas Christian team would most likely finish the season ahead of an undefeated Boise State squad in the Bowl Championship Series rankings due simply to strength of schedule. If Iowa, Cincinnati and Texas all lose, then the question is which team will rise up to number 2 in the country to face the winner of the Florida-Alabama game. No WAC or MWC team has ever played for the BCS championship. It would seem logical that Oregon would jump over both TCU and Boise State and take a place in the national championship game. But remember, Oregon’s loss is to Boise State. Will the voters be reluctant to leapfrog the Ducks over the Broncos? And what about TCU? Boise State’s weak schedule should keep the Broncos behind the Horned Frogs in the BCS standings. We have stated before that we do not believe that Boise State is one of the best teams in that nation. This is exactly the scenario we would like to see play out over the next few weeks because we love anarchy in college football. Anarchy may be the only way that we achieve a playoff in the college game, so the sooner that happens, the better. Playoff Now!